I am working on something that I hopefully will be able to ever finish. While doing so, I had to go through the titles that vampires can have in vtes and I noticed many things I basically always knew, but never really saw the whole picture. With hopefully many new players being embraced and methuselahs waking from torpor who might want to refresh their knowledge before entering the eternal struggle again, I thought this would make a really good article! I would say titles represent the role a vampire takes within its sect. It represents social status and influence. Here we have the first important note: titles are affiliated with sects. Each sect (Anarch, Camarilla, Independent (I know, I know…), Anarchs, Laibon and Sabbat) has its own set of titles. How these titles actually work, what restrictions there are, etc, can be very different and we are going to look at these in detail soon. The main use of titles is to cast votes during the referendum of a political action, but some cards require a specific title to be played, or sometimes titles serve as a condition to trigger stuff like +bleed or what not on cards. Let’s go through these by sects in alphabetic order. Note that unique titles are written starting with a capital letter and non unique titles start with small letter. This way you can know if a title is unique just by the spelling. For example: primogen, bishop, magaji, cardinal or priscus are not unique, Prince of Brussels, Archbishop of Montreal, Liaison, Guruhi Kholo, Ventrue Justicar or Malkavian Inner Circle are unique. Fun fact: there is only one exception to this rule: regent. Regent is a unique Sabbat title, but is still written „regent”. I honestly believe this is a mistake and it should be spelled „Regent”. Anarchs are special in a way as they only have one kind of title: Baron. Baron is a city title. This means, that while the title of Baron is not unique (you can have several Barons) a Baron can still contest its title. Any given city can only have one title associated to it. So for example Baron of Seattle and Prince of Seattle would contest for the city’s title. The cost for an anarch to contest a city title with a Prince or Archbishop is increased by 1. Anarch vampires either get the title of Baron by merging with their advanced version, like Danielle Diron or Jeremy MacNeil for example or they can acquire the title through Fee Stake actions, like FeeStake: Boston for example. 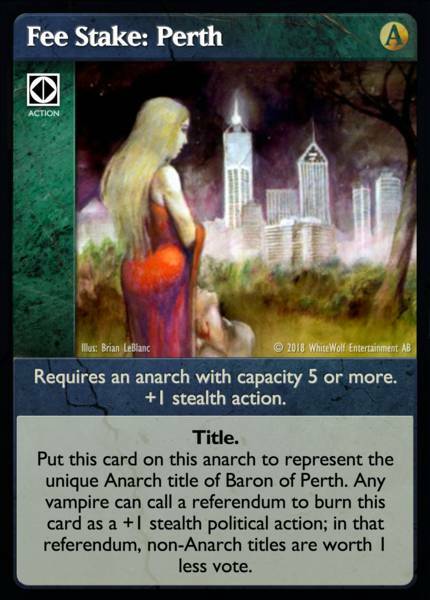 Alternatively any vampire with a city title can become anarch Baron of the same city using Anarch Secession. 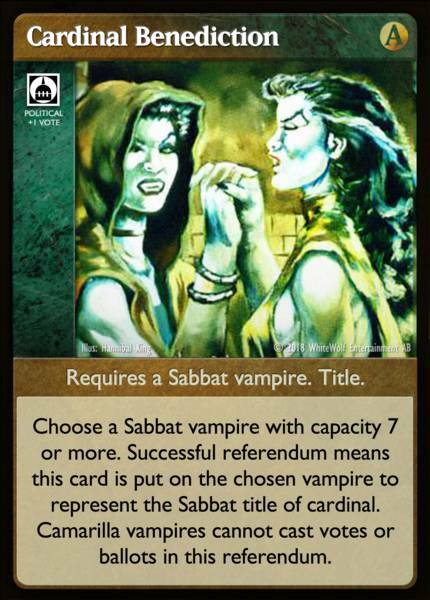 Typically vampires can acquire titles through a political referendum, like the Crusade, Praxis, Cardinal Benediction or Justicar cards. Anarchs are the only ones getting their titles through an action and that sets them apart. While it might be easier to get a title this way it comes with the drawback that Baron titles acquired through Fee Stake actions can be removed. Also note the capacity requirement: only Anarchs above 4 can play a Fee Stake. This (sadly) prevents Daughters of Cacophony or Valkyrie Anarch vote decks. Since a recent change, Anarchs are now a sect. All existing Independant cards have been errated to be also played by Anarchs, but that might not be the case on future cards. The Camarilla titles are as follows (votes in brackets): primogen (1), Prince (2), Justicar (3), Imperator (3) and Inner Circle (4). The title primogen can be aquired through the card Of Noble Blood. The other three titles are not unique by themselves, but they are unique in combination with a city or clan. You can have several Justicars or Inner Circles, but only one Gangrel Justicar or Toreador Inner Circle. The title Prince can be acquired through Praxis Seizure cards, some of these can increase the vampires’s capacity by 1 if the vampire belongs to a specific clan. The title Justicar can also be aquired through a political action and is clan specific, like Brujah Justicar for example, in such a referendum all vampires belonging to the named clan get +1 vote. This title is therefore quite easy to get in weenie/breed decks, but it comes with the disadvantage of being unique to each clan, unlike Sabbat’s cardinal title, that is also worth 3 votes, but is not unique. Inner Circle can not be aquired. Imperator is a unique title obtainable by the Imperator card or by merging Karsh. The title itself comes only with 3 votes, but both options providing this title will add an additional 3 votes in a blood hunt referendum and will also allow this vampire to play Blood Hunt cards from your hand or ash heap as a Prince. The independent titles come with either one or two votes, are not unique and as far as I know can not be obtained through any library card. The one special exception being the unique title Liaison which can only be obtained through the card Rise of the Nephtali and is worth four votes. Laibons have two different titles, the non unique magaji (2) and Kholo (2), a unique title for each clan. Kholo is very strong in my opinion as it can be acquired through a card that you can play either as an action modifier or a reaction card (like Guruhi Kholo). It does not take you an extra action to get this title. The title magaji is quite frequent on vampires, but can also be acquired through the card Overseer. It is pretty much designed for Guruhi decks only and I don’t recall to have ever seen one played. The Sabbat titles are as follows (votes in brackets): bishop (1), Archbishop (2), cardinal (3), priscus (~3), regent (4). The title bishop can not be aquired except through special card text like Tobias Smith`s. Archbishop titles are very similar to Prince titles. They are acquired through Crusade cards, which sometimes come with the ability to unlock the acting vampire in the discard phase if it is of a given clan (Crusade: London for example). The title cardinal is really strong as it is the only non unique title worth more than 2 votes and Cardinal benediction, the political action card that can make a vampire Cardinal, is one of the easiest to pass. 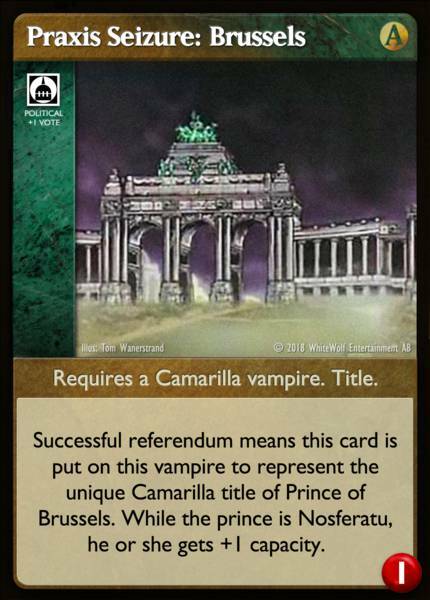 The capacity requirement of 7 or more is not too high and Camarilla vampires cannot vote during this referendum, so if you build around it you can easily have several cardinals in play. The priscus title is a very special one. All prisci hold a sub referendum, in which each priscus has a default 1 ballot (basically a vote usable in this sub referendum). After the prisci decided if they support or oppose the original referendum they together have 3 votes. A vampire can become priscus through Investiture. Cardinals gain one additional vote and Camarilla vampires can not vote during this referendum and there is no capacity requirement. In terms of how the titles work I personally consider Sabbat to be by far the strongest sect. Regent is a unique title that can be acquired through the master card Regent, comes with quite some drawbacks, but the advantage of getting 4 votes through a master card is worth considering it. Currently the only vampires that are regent are Sha-Ennu and merged Melinda Galbraith. Thank you for reading, I hope you found this article useful. As always comments and feedback is much appreciated and will motivate me to write more articles. Also I want to thank Orpheus for his help and amazing support! Unless things have changed, those one and two votes titles on independent vampires are not really tied to Independent sect, but are vampire specific. So if Mata Hari uses Anarch Secession to become Anach, she retains her 2 votes. Vampires with built in actions: my new obsession! Testing mp3 embed from google drive. Tales of Blood. A Vtes Love Story! A long gap and a lot of images.